Racing at the Tour Down Under presents a logistical challenge, but once there things generally run smoothly for the mechanics. ADELAIDE, Australia (VN) — Racing in the southern hemisphere means more than summer-like heat and sunny skies. For mechanics working at the Santos Tour Down Under and the Cadel Evans Great Ocean Road Race, the trip to Australia presents some unique logistical challenges. For Sky head mechanic Gary Blem, working the Tour Down Under is both a challenge and a pleasure. After all, it beats being in Belgium right now. Because the races are so far away, much of the race infrastructure is sourced locally. That means all race vehicles, vans, and team cars are branded with Aussie plates. And it obviously means no team buses. At the Tour de France, for example, Team Sky has two mechanic trucks as part of its fleet of race vehicles. At the Tour Down Under, each team has two race cars and one passenger van to haul around the riders. Blem carries a suitcase full of tools and keeps it light. A stage race adds another dimension for the mechanics. Because Tour Down Under is the first race of the season, any new components or equipment need to be tested and up and running before heading to Australia. Most of the pre-season testing happens back in Europe during the winter camps. Teams are limited by weight and volume, so they travel with only what’s needed to perform. There is a limited wheel selection and only the bare necessities of tubes, water bottles, gels, lubricants, and even frames. Teams can bring extra equipment if they’re willing to pay the over-weight fees. Mechanics can also tap into local bike shops for urgent needs. Another key factor, at least when it comes to logistics, is that the Tour Down Under does not include a time trial stage. That would add another major wrinkle to the logistical challenges if teams had to travel with time trial frames, wheels, and other specialized gear for a race against the clock. Some teams are only down for the race, while others like Team Sky stay for the Cadel Evans Great Ocean Race and the Herald Sun Tour in early February. Many riders come down early to acclimate to the heat and use the warm weather and great training conditions to prepare for the season. Teams at the Tour Down Under ran a light program and brought a skeleton crew. Sky, for example, usually has three mechanics per race, and even as many as four during the Tour de France. At the Tour Down Under, it was only Blem and one of his colleagues. On the upside, after the long flight and logistical challenge of getting everything to Australia, once they’re in Adelaide, everything is much easier. 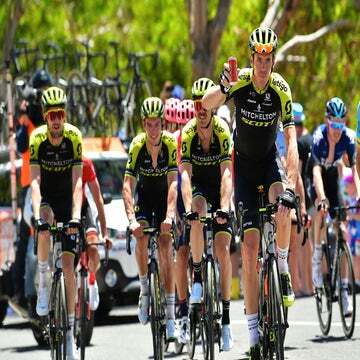 Unlike most stage races, there is no point-to-point racing at the Tour Down Under. 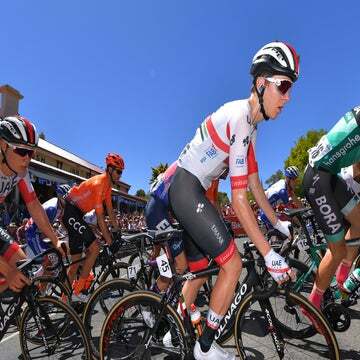 Instead, riders and staff stay in a hotel in central Adelaide and race on a series of cloverleaf stage designs throughout the week. The peloton shuttles out to each stage, completes the day’s stage, and returns to Adelaide. Mechanics have a central hub in a plaza right across the street from the main hotel where they can store bikes overnight and have a complete workspace set up to maintain, clean, and build the bikes. Other races have handled the logistical hurdles by loading everything into cargo containers and flying them in bulk to the destination. Last year’s Giro d’Italia “big start” in Jerusalem presented an even larger logistical challenge. Like the Tour Down Under, no team buses went to Israel. They were parked and waiting in Sicily for the entourage after three days of racing in the Middle Eastern nation. Blem and his staff packed the bikes into bike boxes because they had no way to travel around Israel with bike bags. Blem and his staffers spent five months plotting out the logistics for the race. Mechanics generally agree it’s easier to work at the Tour Down Under than on some of the other foreign trips to such places as China or the Middle East.